ConverseConverse All Star Modern HTM in leather. It’s not often a classic gets reinvented twice in as many years. But for a dinosaur of a shoe like the Converse All Star, it just makes sense. Hot on the heels of the Converse All Star II released last year, parent company Nike is reinventing the classic basketball shoe again. This, time, however, the shoe has been completely reinvented and reimagined. While the All Star II kept the original styling of the All Star, with only tweaks to the styling to update it while making it more comfortable, the All Star Modern, completely changes it up. In the more expensive limited edition version of the shoe, goat leather replaces canvas for an upscale look with the All Star patch embossed on the side. Nike has also made a permanent collection of knit versions of the shoe. Both boast an impressive amount of Nike proprietary technology that makes the shoe breathable, durable, and lightweight. A soft Neoprene tongue was even added for additional comfort. 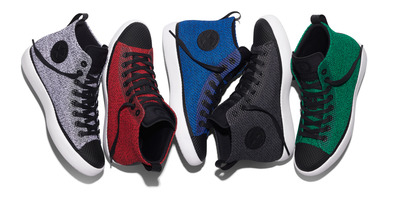 ConverseThe Converse All Star Modern sneaker collection in knit. 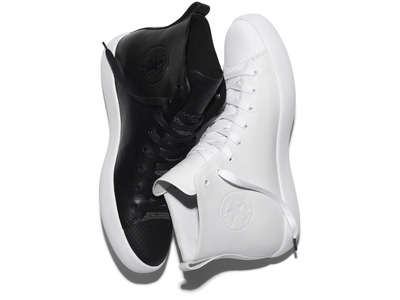 The leather versions come in black and white and retail for $180. They were designed through a collaboration called HTM, that includes Nike CEO Mark Parker, streetwear brand Fragment Design founder Hiroshi Fujiwara, and Nike design legend Tinker Hatfield. The knit version of the modern comes in black, red, green, and blue for $140 and come in both high and low top. They’re now the most expensive mainline sneakers Converse sells. The release of these shoes shows that Nike is finally trying to modernise the 108-year-old brand by infusing it with the magic that turned the parent company into the world’s most valuable apparel brand and largest athletic apparel company in the US. It’s mixing handsome vintage inspiration with wearable styling and proprietary technology and selling it at a higher — but not unreasonable — price than their usual offerings. The redesigned All Star II’s gained a following when they were released last year to positive reviews. Nike won’t mess with success with these new versions, however. Many customers are very attached to the original Converse All Stars, and these new designs are meant to compliment, not replace those.